.Duel was a success for Steven Spielberg, and Alex Garland had a wonderful success with Ex Machina. Conversely, Cinematographer Wally Pfister’s Transcendence wasn’t as well received. Though he has worked on TV, Pfister hasn’t had a motion picture follow-up (though I’m eager to see him do so). Everyone moves in different directions and at their own pace. Steven S. DeKnight is well-known for his work on Daredevil and the Spartacus series on Starz. He makes the leap to directing with Pacific Rim Uprising, the results of which are a mixed bag for me. I saw the original four times in the cinema. Uprising has some fun moments, most of them with John Boyega (John Boyega, Star Wars: The Last Jedi) and Cailee Spaeny (The Shoes), but it wasn’t particularly memorable for me. I don’t know if I could actually say I hated it. That doesn’t mean that the kids won’t love it. There are some good moments of action that are reminiscent of Saban’s Power Rangers, and the movie provides exactly what it advertises – Jaeger on Kaiju action. 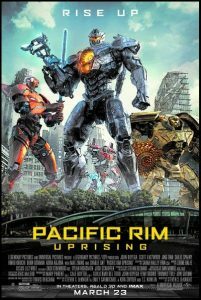 Uprising takes place ten years after the end of Pacific Rim, focusing on Jake Pentacost (John Boyega, Star Wars: The Last Jedi) son of the now legendary Stacker Pentacost. The world has moved on from the Kaiju crisis in various ways. When a new threat looms on the horizon, Jaeger pilots are needed once again. Jake would rather not get involved, plowing his trade as Jaeger tech smuggler. When he meets up with Amara Namani, a young hacker (Spaeny), both are brought into the newest rendition of the Jaeger Program. This also leads to a family reunion of sorts with Jake’s sister, Mako Mori (Rinko Kikuchi), who now heads the program. We even have our favorite scientist duo returning in Gottlieb (Burn Gorman, Game of Thrones) and Geiszler (Charlie Day). With all this familarity, you’d think that more of the same is the perfect recipe for a sequel. The plot could have used a little more development, at least in comparison to the first firm. Uprising does stand on its own, and I could see some interesting arcs develop in future films. My problem with it was just that I didn’t feel a sense of worry for anyone. In the first film, there was this sense of escalation. Every incident was increasingly more dangerous for everyone involved. I didn’t quite feel that this film, but it makes up for it for having some interesting action scenes. DeKnight keeps the scenes short and sweet, and the flow of the movie is quite good, despite the lack of fights. Those moments are few and far between, which kind of left me a little drowsy waiting for them. From a character standpoint, the real gems in Uprising are Jake and Amara. Boyega and Spaeny are great in just about every scene they’re in. Scott Eastwood isn’t bad either, actually, though he really isn’t given much to work with. Everyone else appears to be filling in roles. While it would’ve been nice to see more characterization in the rest of the crew, they do what they need to in order to keep the story moving. Visually, Pacific Rim Uprising hits all the right notes. The Kaiju are strange and the Jaegers are impressive. The action moves in such a way where you’re not too lost with what you’re viewing. If there are any problems in this area, it’s that they appeared too clean (and that’s just a nitpick, really). Where the Original used nighttime or rainy shots to mask the effects (much like the first T-Rex encounter in Jurassic Park), most of Uprising’s effects are in broad daylight. It looks great, but also had a HDR quality to it that (for me) felt like you were watching a high end demo reel. The 3D also helped with the effects there. Overall, I’d easily catch Pacific Rim Uprising again once it hits the digital circuit. It might be worth the viewing on an IMAX screen or even in 3D, but it isn’t anything anyone needs to rush to see. This entry was posted in Film, Uncategorized and tagged Burn Gorman, Cailee Spaeny, Charlie Day, John Boyega, Legendary, Pacific Rim: Uprising, Rinko Kikuchi, Scott Eastwood. Bookmark the permalink.